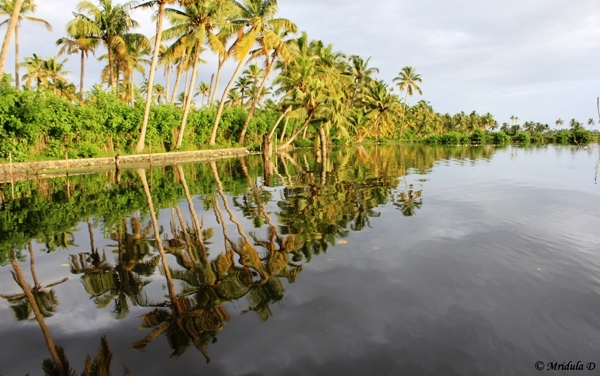 After Fort Kochi, Kerala Backwaters were my next stop. 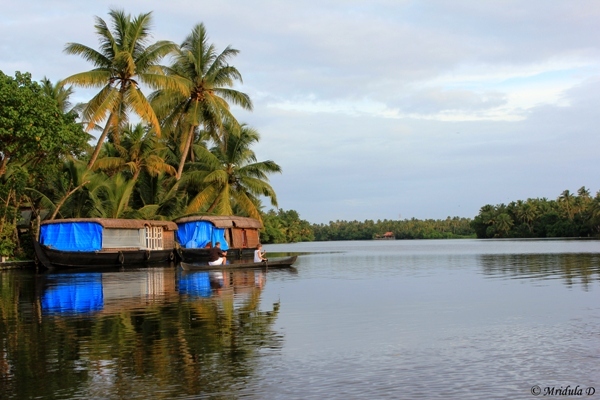 But instead of the traditional places Travspire offered me a cycling, walking and boating trip with my base at Breeze Backwater Homes in Kuthiathode. My room there was literally five steps away from the backwaters. Before lunch I had gulped two cups of tea and spent quite some time hanging in a hammock. 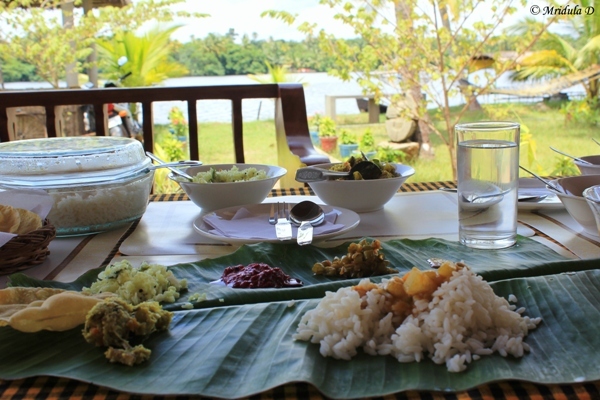 Before cycling I had a big traditional Kerala lunch served on a banana leaf. The stuff was seriously good but the amount of food I consumed was not ideal for a day of cycling. Such unwelcome thoughts were, however, pushed aside and I concentrated on enjoying my meal. Vishnu was my companion for the trip and Appu took the car so that he could bring the cycles back when we went for boating. 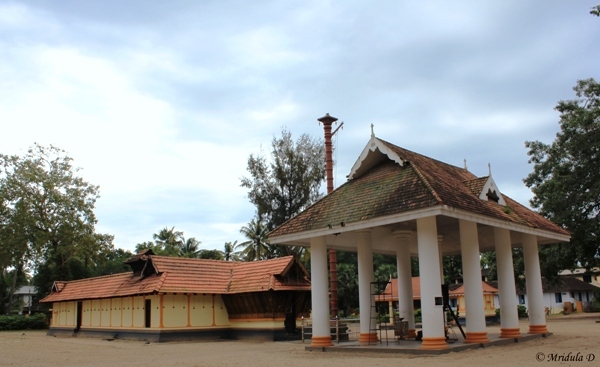 One of our first stops was the local temple where I asked Vishnu if the locals still knew each-other? He said that they certainly did and temples were the usual gathering places for the people. He also said to enter the people have to wear traditional dress which meant sari for women. But a group of women went to High Court and won the right to enter in Salwar Kurta! I was quite surprised to hear that. 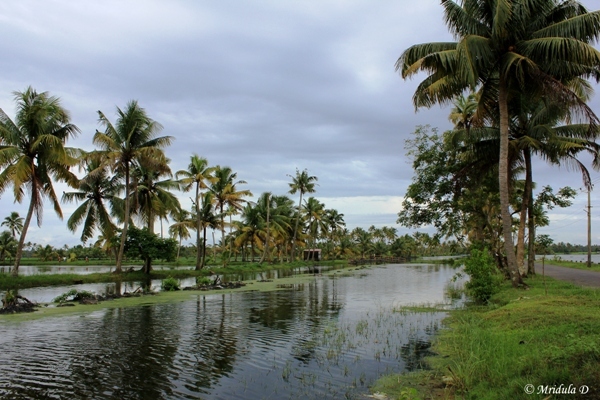 The path partially went through the village and then it opened to the backwaters and open spaces. Even in the village lanes people were tolerant of us, they would only honk us out gently out of the way. At no point I thought it was unsafe to cycle around. And in the open spaces it was a lot of fun. At this spot there was a local toddy shop. Vishnu gently mentioned it and I did not pursue it. Now I wish that I had gone and had some local toddy along with fish. I generally don’t eat fish but I can nibble at it maybe once every 2 years. Someone else have to finish the dish for me. 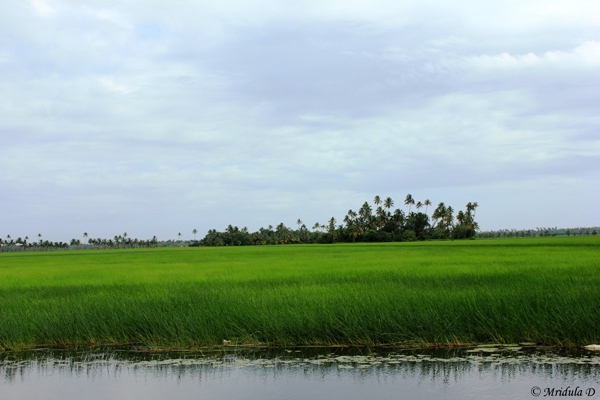 We cycled past lush green paddy fields stretching long and wide. It was a sight to behold and the picture above is rubbish compared to the actual scene. I will admit readily that sometimes I do take pictures that can make a place look better than it actually is but this is not one of those pictures. We would stop whenever we came across something to admire. And I stopped for the longest time near the paddy fields. My cycling adventure came to an end near Chettanam Fishing Harbor. Here you can see Vishnu chatting to Appu (whom you can’t see, he is sitting inside the car). 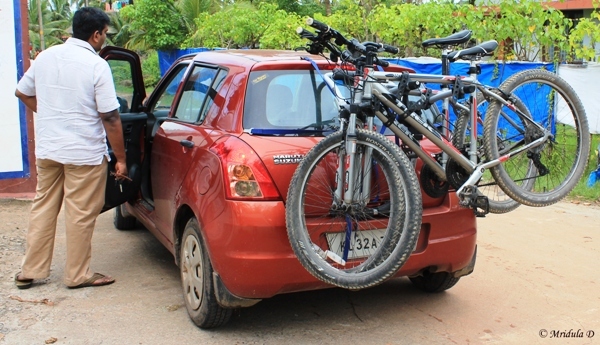 The cycles got loaded to the car in the end. I was glad I could cycle all the eight kilometers without falling off once. At one pint there was a lot of water across the dirt track. I almost fell there but in the end I managed to get through without splashing mud all over the cycle and me. 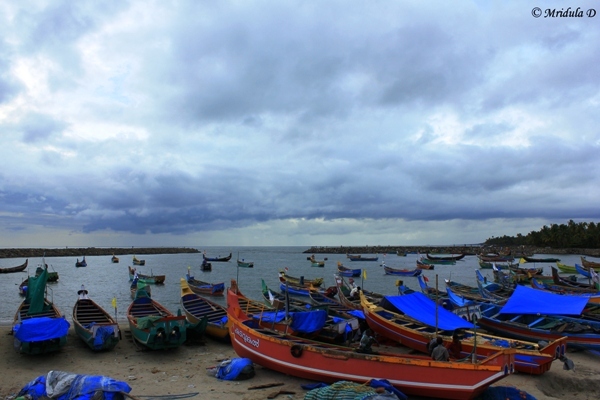 Chettanam Fishing Harbor is used by local fishermen. The black curves you see toward the horizon are protective structures made for the ships so that they can enter the sea in comparatively rough weather as well. Vishnu mentioned that sometimes the catch from a single trip could be worth 3 lakhs Indian rupees (.3 million) which would be then shared between all the members of the boat. We walked along the stone structure for sometime. 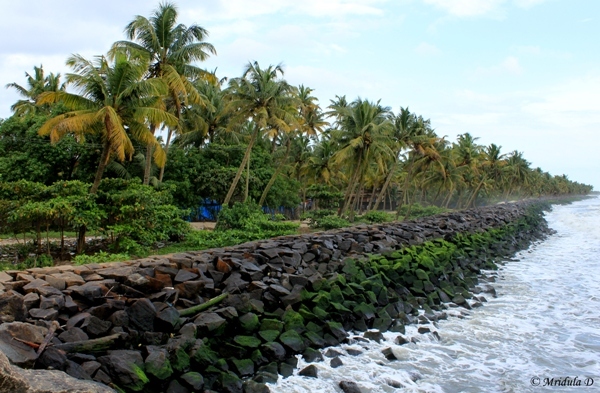 And as we tuned back I saw this beautiful shoreline dotted with coconut trees, as far as my eyes could see. The sea was rough though. For here our boat trip was a short car ride and even a shorter walk away. Our boat was a small one. It was rowed with help of a long bamboo pole. The water in the channel was shallow. And the boatman was proud to point out that it was a non-polluting vessel. Also being smaller than the houseboats it can once again navigate through smaller waterways. There were many caretaker huts along the way. Occasionally a lone person would be walking away on the other side of the bank. There were steel bands along some coconut trees which Vishnu told me were meant to discourage rats. 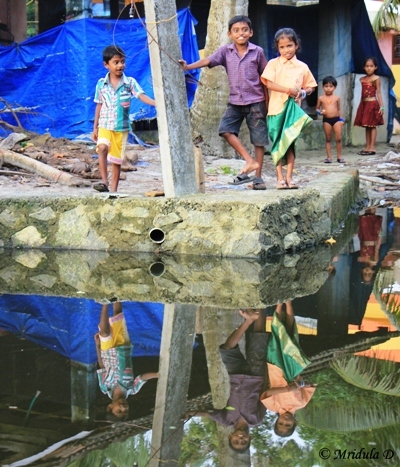 At one point I crossed these curious kids all happily playing along the water, no gadgets in site. This was an absolutely quiet stretch and I enjoyed the silence. It is music to my city strained ears. In fact this was the only other traffic we encountered. There were foreigners in the small boat rowing it all by themselves! And the two houseboats parked by the side. Soon we were back to Breeze Backwater Homes. It was time for another round of tea for me. What a beautiful evening it was! I have to take my daughter to the place one day. When I arrived at Pokhara, Nepal it was not raining. It felt like a minor cause for celebration as I had seen more rain than I would care for on the Annapurna Circuit Trek. However by the time I finished lunch and started walking around the beautiful Phewa Lake, it has started raining again. I could spot a shelter near the lake so I decided to hide there. 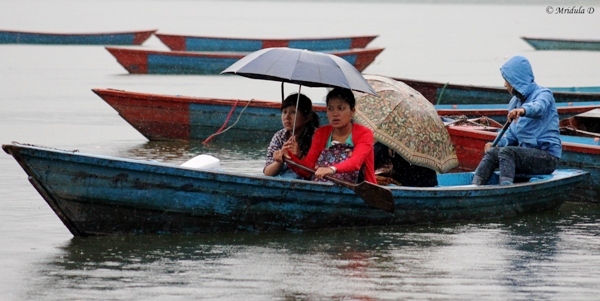 And that is when I noticed the first bunch of boat women at Phewa Lake. I noticed them because the young girl in the blue top was sitting next to me at the shelter and listening to music on her cell phone. And then suddenly a few of them assembled, got into a boat and rowed away! I was surprised and intrigued. You may rightly ask now why should that be? I would say turn your mind to all the boat trips you have taken and tell me how many boats were rowed by women? Chances are like me, you have no experience of it! Even the famous Gondola rides of Venice are in news for denying women the right to row rather than anything else. It was 2010 when Venice had its first woman gondolier. 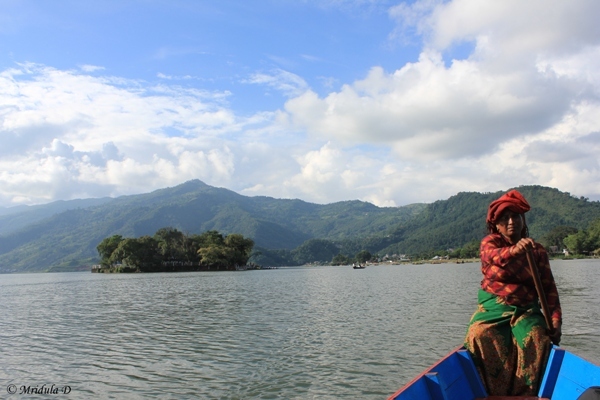 So imagine my surprise when I saw quite a few boat women at Phewa Lake, Pokhara, Nepal. The day I arrived I was too dazed to inquire more and when the rain lessened I headed to the Bamboo Bar and for the first time in my life I put my feet up and had a glass of wine all by myself. But I am digressing, that is a story for another day. The next day I came back to the lake and tried talking to the boat women. Hindi TV (Colors and Star Plus to be more precise) is very popular in Nepal, so a lot of people can speak some Hindi and almost anyone will understand it! And that gave me hope. The first boat woman that I found was resting by the shore as her turn would not come for sometime now. She understood some Hindi and when I asked her why she started rowing the boat for tourists she said in Hindi and with signs, “I have to eat food.” I have to say this was not the answer I was expecting. I talked to two more boat women and the answer firmly remained the same, they did it because it was a source of income. There was absolutely no romanticism associated with it at all! I was generally not interested in a boat ride but then I decided to go with a boat woman. It was not an easy task as the boats would go by turns and it was not necessary that I got a boat women. Then came Lakshmi who told me to go and get a ticket and she would take me on the ride. The ticket cost me Nepali rupees 365 as I was going alone. She managed to do it by swapping turns with the person who’s turn it actually was. Lakshmi understood and spoke some Hindi. And it was fun to be with her on the lake for an hour. She also said the same thing, she started boating to earn money. She already knew how to row because she would go in a boat to collect firewood in the jungle. In return she asked me if I was scared traveling alone! 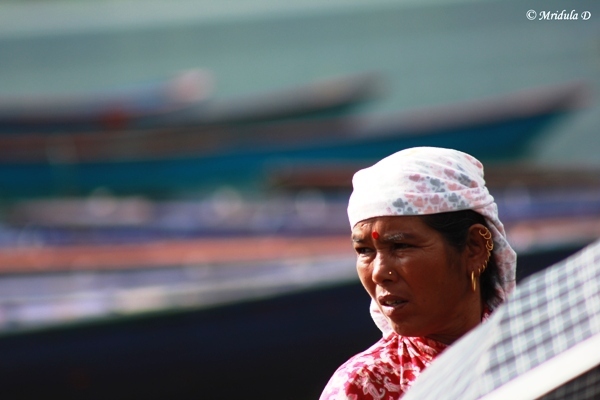 I was utterly awestruck that these women thought there was nothing special about their being a boat women. For me they are awesome. I was recently reading on DPS that try sitting still for 10 minutes before you take a shot. Obviously I didn’t do that before I took this shot at Lake Windermere. If I had taken 10 minutes I am sure there would have been a better composition. As of now all I have done is to crop out the faded sky. Can you sit still for 10 minutes before you compose a shot?